I’m writing this from The Nature Conservancy’s Niobrara Valley Preserve in north-central Nebraska, where I’m attending a prescribed fire planning workshop. The weather up here is beautiful, and the prairies are already wearing their autumn colors. The most conspicuous color on the landscape is the bright red of smooth sumac, which contrasts wonderfully with the more subtle browns and golds of the grasses. Smooth sumac and prairie along the Niobrara River at The Nature Conservancy’s Niobrara Valley Preserve. This photo was taken in one of the few parts of the Preserve that wasn’t impacted by the big wildfire of 2012. I walked and photographed areas that were affected by the fire as well, and I’ll post some of those photos and descriptions soon. In short, everything I saw is looking great; no significant invasive plant issues, complete recovery of grasslands, and positive developments under the burned pine woodland areas. 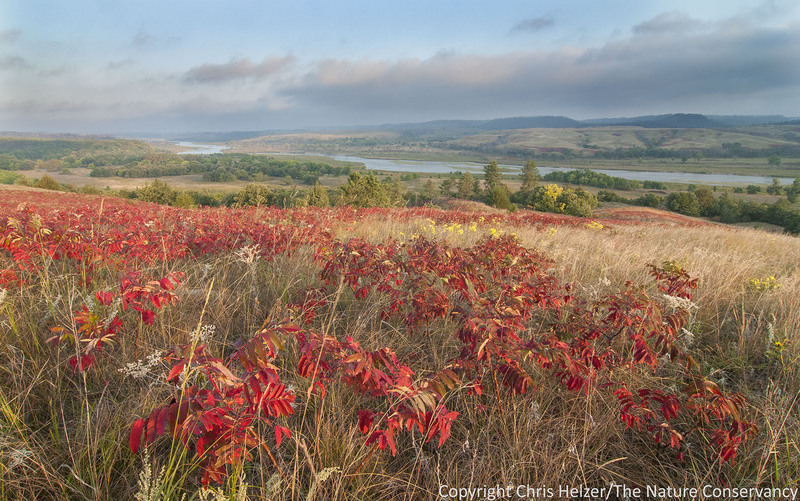 This entry was posted in Prairie Natural History, Prairie Photography and tagged autumn, color, fall, grassland, niobrara river, niobrara valley preserve, prairie, sumac by Chris Helzer. Bookmark the permalink. Great photo Chris! Thanks for sharing. Great photo! Still have a photo of sumac hanging in my office that you took years ago. Great to look at, but from a management stand point here is a question. What is the native/natural check for sumac? Doug – thanks, I’m glad you like it. The sumac question is a tough one. Surely there were large browsers such as elk and pronghorn that would have played a role in suppressing sumac, but I’m not sure if those browsers alone would make enough difference. I would guess a combination of climate (we’re in a relatively wet period now), lack of browsing pressure, and changes in the fire regime is responsible for more sumac today than a couple hundred years ago. But I’m just guessing.